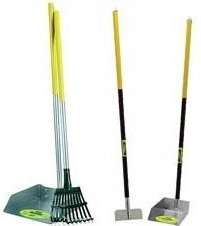 Wee-Wee® Rake Set and Spade Set. Great for scooping up animal waste around the yard. These sets are extremely durable and made with an aluminum collection base that won't rust. Use the rake set for grassy areas. Use the spade set for sidewalks. Each style is available in two sizes.